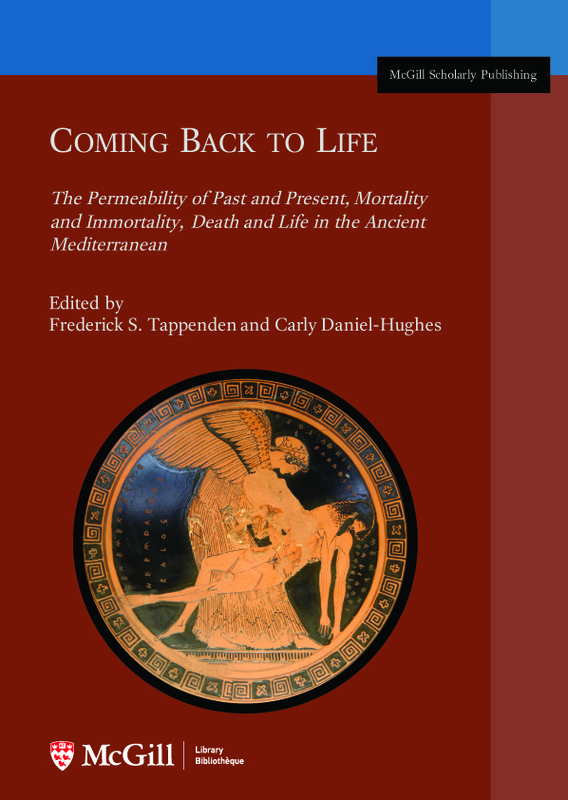 Coming Back to Life: The Permeability of Past and Present, Mortality and Immortality, Death and Life in the Ancient Mediterranean. Edited by Frederick S. Tappenden and Carly Daniel-Hughes, with assistance from Bradley N. Rice. Forward by Gregory Nagy. Montreal, QC: McGill University Library, 2017. The Coming Back to Life eBook includes essays from an international collection of established and emerging scholars: Sarah Iles Johnston, Vita Daphna Arbel, Roger Beck, Troels Engberg-Pedersen, Hugo Lundhaug, Frances Flannery, Valerie Hope, Meredith Warren, Katharina Waldner, Angela Standhartinger, David Eastman, Jeffrey Keiser, Stéphanie Machabée, Eliza Rosenberg, Bradley N. Rice, Carly Daniel-Hughes, and Frederick S. Tappenden. Papers reflect interdisciplinary sophistication in a breadth of theoretical fields, including issues of memory, performance, cognition, gender, genre/narrative, ritual, and cultural studies. As a joint initiative of the McGill University Library and the School of Religious Studies, the Coming Back to Life eBook establishes proof-of-concept for McGill’s eBook publishing initiatives. This volume is designed to harness the power of digital technologies. Embedded throughout the collected essays are hyperlinks to online critical editions of primary literature, museum exhibits, and images of artifacts and archaeological remains. By drawing these online resources together, this volume brings the literature, thought world, practices, and material cultures of the ancient Mediterranean back to life in ways that are impossible in a traditional print format.